Histon FC was formed in 1904 and were originally known as HISTON INSTITUTE, hence their nickname of 'The Stutes' They started out in the Cambridgeshire League before moving to the Spartan League in 1948. By 1951 they were in its top tier, changing their name to the current one the following year. Unsuccessful spells in the Delphenian and Athenian Leagues followed in the first half of the 1960's before they joined the Eastern Counties League in 1965. They struggled for a while before having their best ever finish whilst the league was a single division of 4th in the 74/75 season. When the league established a second tier in 1988, they remained in the top division until they were relegated to Division 1 in 1995. They remained here for two seasons until 1997 when a runners-up spot behind Ely City was good enough to see them promoted back up. This kicked off an incredible run of success and after two top 4 finishes, Histon were promoted as champions at the turn of the century. A four-year spell in the Southern League Eastern Division followed before a runners-up spot behind Kings Lynn was good enough to see them promoted to the Southern Premier in their centenary year of 2004. In their first season at Step 3, they were promoted to the Conference South after winning the league. After a 5th placed finish in their debut season, they lost to St Albans City in the end of season playoff final, 2006/07 saw them promoted to the Conference Premier after finishing as champions. They spent for seasons at non-league's top table, following up a debut season where they finished 7th with a third-placed finish in 2009. They lost out to Torquay United in the playoffs. However, as quick as the success came it went. Histon finished 18th in 2010 before a five-point deduction for financial reasons saw them finish rock-bottom the following season. Generally, though, finances have been kept in check, despite geography seeing them placed in the Conference North. The last six seasons have proved to be tricky on the field however with 16th place in their debut Conference North season being the highlight. They were relegated to the Southern Premier in 2014, then dropped down to the Southern D1 Central in 2016. Last season saw yet another relegation, with only Petersfield Town keeping them off the foot of the table. They will start the 2017/18 season in the Eastern Counties League for the first time in 17 years. They do have a well-known name in the dugout - former Sheffield Wednesday & Rochdale keeper Lance Key who also played 124 games for Histon during their most successful period. 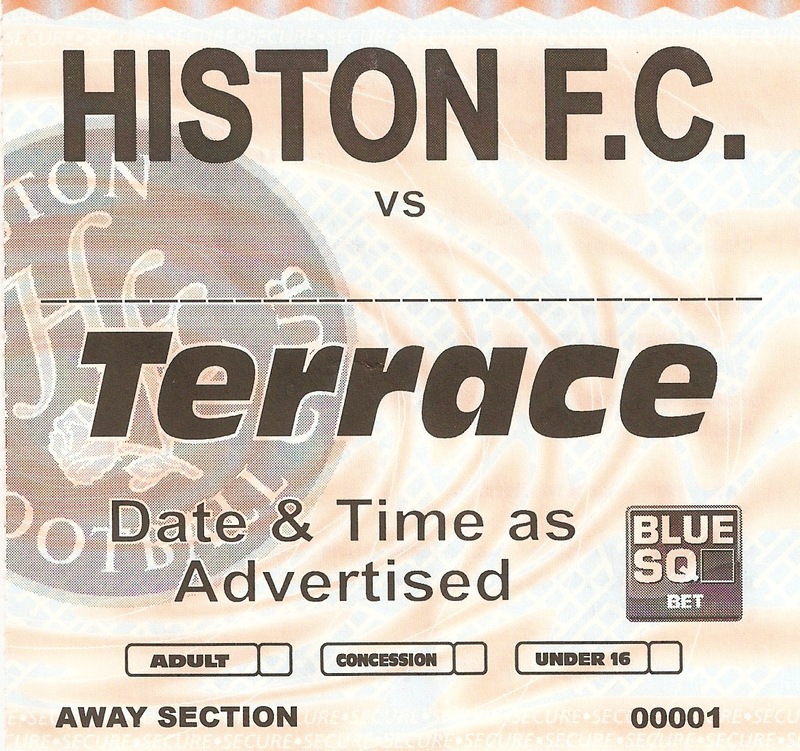 In the FA Cup, Histon had been on several good runs before they broke all records in the 2008/09 season. That year they were exempted until the 4th Qualifying Round due to their Conference status, but even so they were handed a tough looking tie at that season's NPL D1 North champions elect, Durham City. The teams drew 2-2 up in the north east before Histon triumphed 5-2 in the replay. They were rewarded with a home tie against football league side Swindon Town in the first round, but despite the odds being against them, they ran out 1-0 winners. Their prize for that victory was a home tie against former giants Leeds United, live on ITV. In an even bigger shock than the previous round, Histon triumphed 1-0 thanks to a header from postman Matthew Langston. In the third round, they were drawn at home to Swansea City and put up a brave fight before losing 2-1. In the FA Trophy, the club got to the 4th Round twice - losing 3-0 at home to Billericay Town in 2001 and 2-1 at Gravesend & Northfleet in 2005. The fourth round is also their best progress in the FA Vase and with the club back in the competition for the first time in 17 years this season, they will be hoping to match the progress they made in each of their previous 3 seasons, prior to their promotion to step 4. Locally, Histon have won the Cambridgeshire Professional Cup on eight occasions and the Cambridgeshire Invitational Cup 7 times. Histon had been a ground that I had been looking to visit for a while, seeing as it was the only ground in the Conference that I had to do at the time. This was back in the day when I was not a proper hopper and counted going to the ground to take photos as a visit. Wycombe were away at Stockport on the 14th August, so knowing that it was not a happy hunting ground for the Wanderers, I pencilled in Histon's match against Barrow as a game to go to. Setting off around 10 am, it left me plenty of time to visit a few other grounds that I had not been to along the way - Garden Walk, the home of Royston Town and The City Ground, where Cambridge City are the home team. I got to Histon just before 1.30 and was met by some very friendly people who let me in their bar. After a couple a pint, I made my way into the ground for the slightly high price of £14. Histon had had fairly well documented financial problems in the summer and as a result had a severely depleted playing budget. New manager John Beck had done his best to cobble together a squad, consisting mainly of youngsters. Barrow was another team expected to be in the lower reaches of the table come the season's end. The visitors took the lead on 10 minutes through a Remy Clerima own goal. They continued to pressurise and could have had more goals. But the home side got the equaliser on 26 minutes through Romone McCrae. 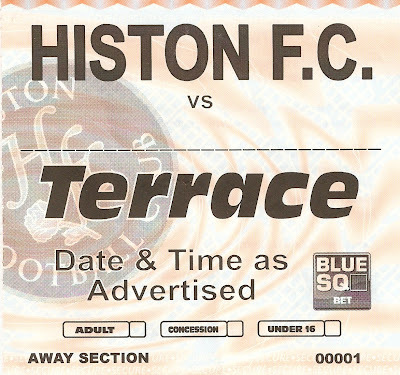 2 goals from Zac Attwood sealed the victory for Histon, they probably deserved it as Barrow faded after a bright start. With the pre-season getting underway for more and more teams, there was a bit more choice than the previous week. Had I elected to visit a new ground, it would have been my 700th. I wasn't overly keen on completing that landmark for a friendly as I had seen a friendly for my 500th and 600th ground. There were a few revisits worth considering and so after speaking to fellow hopper Anwar, we agreed that Histon, being the nearest choice, would be a good choice. I last visited there in 2010 when they defeated Barrow 3-1 in the Conference Premier. They'd suffered a fall from grace since then, starting the coming season in the step 5 Eastern Counties Premier following their relegation from the Southern League Division 1 Central last season. I'd seen them on their way down - back in 2013 I'd seen them draw 1-1 away to Solihull Moors as they battled relegation from the Conference North. It was a battle they eventually won, for that season at least anyway. I was impressed with Danny Fitzsimmons, their central defender who put in a commanding performance for a young player. He was signed by John Still for Luton and played there for a couple of seasons before drifting back into non-league football after an incident in a nightclub. The only sticking point with my revisit was that we weren't even sure where it was being hosted with no definite news on the Histon website and no response to Twitter enquiries. This had been the same for another hopper for their Saturday game against Wisbech although given that it had been played at their normal ground and that tonight's game kicked off at 7:45, I was fairly confident that it would be at their usual venue. Another former Histon player was Nick Freeman who had signed for Wycombe last summer and he was part of the Wycombe side that had taken part in an uninspiring 0-0 draw at Slough Town on the previous Saturday. On the day of the game, I was pleased to see confirmation of tonight's game on Histon's website, though it was scheduled to rain from lunchtime onwards. Frustratingly, the afternoon deluge had put pay to my original plan of Histon, with the Biggleswade Twitter announcing it had been put back until Thursday at around 4.15. I now had to make arrangements for an alternative game and given that over 24 hours later, Histon had still not updated their Twitter with news of the postponement, it's unlikely that I will revisit now. A shame as it was fairly local and they made the right option not risking the pitch for such a low key game, but with blog now updated, there is no incentive to visit again. THE GLASSWORLD STADIUM struggled to keep up with the rapid progress Histon made up the leagues. As a result, only the old main stand remains, albeit with an extension on the side. The other 3 sides are what is known as "Arena" stands, basically metal stands, that are packed onto the back of a lorry and assembled at the point of use. Usually, these are made for clubs looking to make the step up to step 5/6 football but on this occasion, they are a lot bigger and make up the bulk of the ground with a terrace at either end and a long seated stand along the side. Overall the capacity is 3800 with seating for 1700.